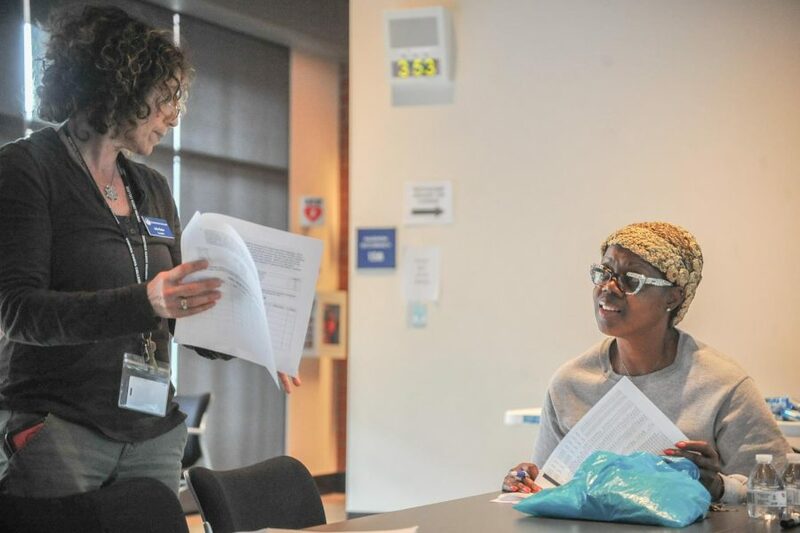 EOPS counselor Julie Skoler (left) helps a student during a compressed calendar informational session workshop at Fireside Hall on Thursday. Despite low attendance, a compressed calendar informational session workshop aimed to clarify the effects of the college’s new schedule which goes into effect starting fall 2018. Dean of Liberal Arts Jason Berner said in addition to reducing semesters from 18 weeks to 16, class times will be adjusted so the start and end times line up neatly. He said this is to ensure picking a schedule of classes is easier for students. “Starting years ago, the district began discussing whether to reduce the semester to 16 weeks. We decided ‘yes.’ Contra Costa College and its sister schools will be on 16-week schedule starting fall 2018,” Berner said. A noticeable change is the removal of finals week. The tradition of altering class times for the last week of a semester will be set aside in favor of having finals during normal class hours. Under the new schedule, more classes will be added on Friday allowing classes to be spread out more. Berner said an English class that used to be a four-hour marathon could be cut down to 3 hours and 25 minutes. All colleges in the district are adopting the same schedule, which Berner said is becoming a California standard now with over 50 other community colleges already using a compressed calendar. Berner said the change is also to make room for a planned winter intersession. The intercession is a winter equivalent of the summer semester. However, the winter intersession will probably be implemented the winter after next, in 2020, he said. There will be a January-start cybersession in 2019 coinciding with a general increase of online and hybrid courses. He said the fall semester would generally start later, Aug. 27 this year, to allow a small break between summer and fall classes. Fall classes will end at around the same time as before in December. The winter intersession will run for 6-8 weeks, mirroring the summer semester. Spring classes will start the first week of February. The frequently asked question handout given at the info session said students will not be required to take winter intersession classes and students will still be able to take full time loads with all morning classes. The handout also stated that fees, tuition and financial aid would be unaffected. However, that may change once intercessions are implemented. Counselors’ availability will increase by 2.5 hours per week but no changes to library hours or other services are planned. Berner said late-start classes would still exist but they may be eight weeks instead of nine. At the beginning of the workshop Crayola markers were handed out to each table. At the end of the presentation attendees were given a little classwork to help them understand the lesson. Counselor Robert Webster said five vignettes were designed to let students work with the information being presented. Attendees were given a list of example classes and a profile of a hypothetical student, listing their needs and available hours. The task then was to use the information to create a workable schedule of classes for their fictional student. Kristin Lobos, vice president of the Health and Human Services Club, said the event was helpful by making her feel less overwhelmed. “If you’re a student who has to work or take care of children, the fast pace might feel overwhelming,” she said. She said the same students might not have time to understand the schedule fully, noticed the low attendance and said the campus should stay informed.